Tune your guitar fast and precisely! Do you have trouble tuning your guitar? Don’t fret, Easy Guitar Tuner will help you check the tuning of your guitar and fine-tune individual strings using its precise chromatic tuner! The chromatic tuner in this app comes with audio input and microphone support, so make sure your microphone is on and turn up the volume. 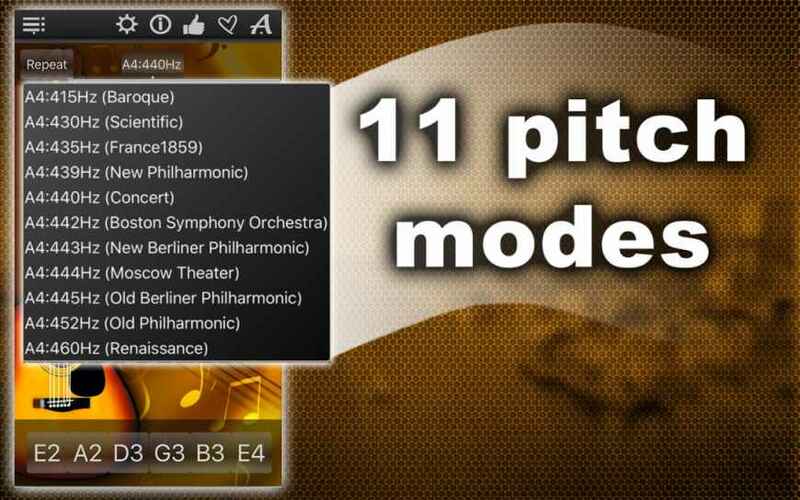 Select the pitch mode you prefer (Easy Guitar Tuner has 11 to choose from). The buttons on the bottom of the app window will show you what each of the six strings is supposed to sound like when perfectly tuned. Another feature of this app is the Repeat Mode. It repeats the sound of your selected string, allowing you to do most of the tuning without taking your hands off your guitar. 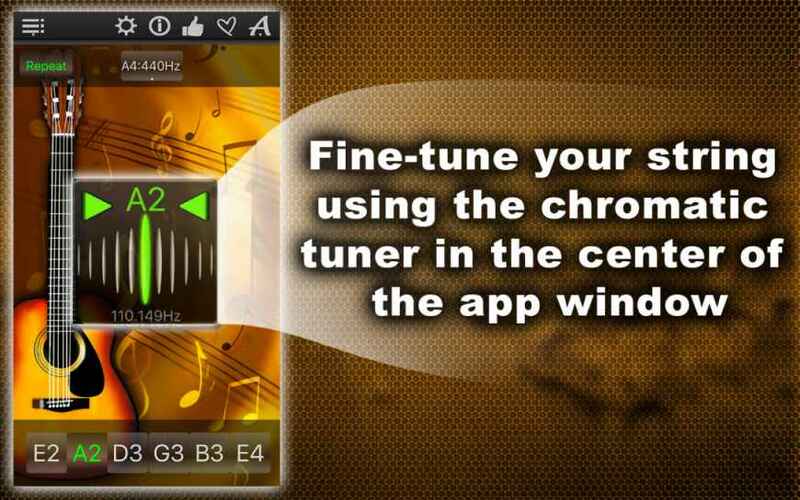 To check the tuning of the string you are working on and to fine-tune it, use the chromatic tuner in the middle of the app window. If your string is perfectly tuned, it will flash green. If it needs additional tuning, the tuner will flash red. It will even tell you, whether your string needs to be tuned up or down: if the arrow on the left side flashes red, it means that your string sounds too low and needs to be adjusted up. If the arrow on the right side flashes red, it means that your string sounds too high and needs to be adjusted down. Just keep adjusting the string until the tuner flashes green. Then, proceed to the next string. 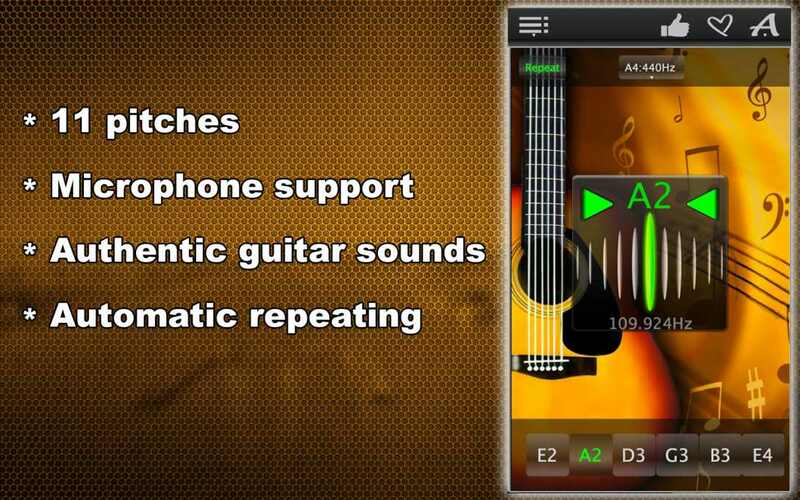 Tune them all with Easy Guitar Tuner and enjoy playing your perfectly tuned guitar! Download Easy Guitar Tuner now! Hello and welcome to Easy Guitar Tuner! This chromatic tuner will help you check the tuning of your guitar and fine-tune individual strings. Authentic acoustic guitar sound for every string will show you the way to a perfectly tuned guitar! What you see in the middle of the app window is a precise chromatic tuner with audio input and microphone support, so make sure your microphone is on! It has 11 pitch modes, such as Baroque, Scientific etc. The buttons on the bottom will play the sound for each of the six strings on a perfectly tuned guitar. 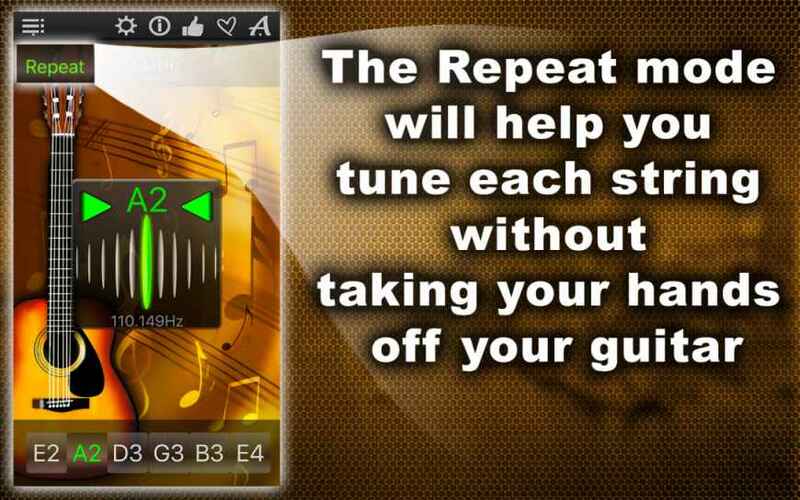 There is also a repeat mode to help you tune each string without taking your hands off your instrument. Now play a note on the first string of your guitar and use the repeat mode to tune it. To fine-tune this string, use the chromatic tuner. If the tuner flashes green when you play the string, it is tuned perfectly. If it flashes red, it still needs to be adjusted. If the left arrow flashes red, your string sounds too low and needs to be adjusted up. If the right arrow flashes red, your string sounds too high and needs to be adjusted down. Keep adjusting the string until the tuner flashes green. Proceed to the next string, and keep going until all six strings are tuned. 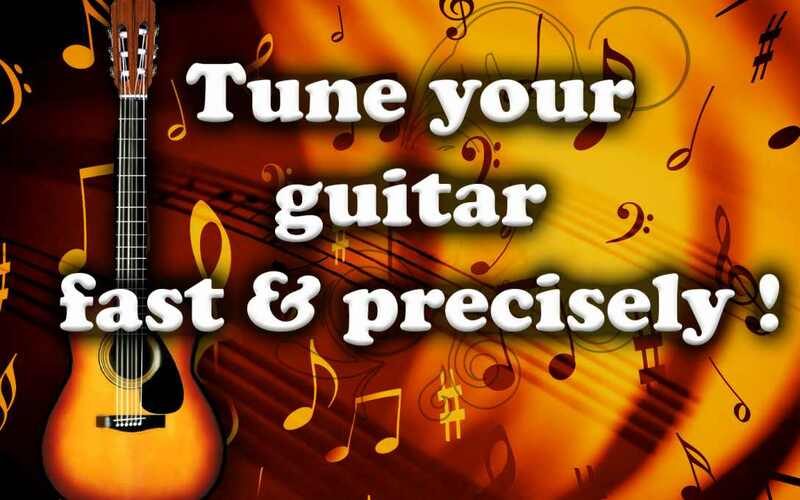 Enjoy playing your perfectly tuned guitar! 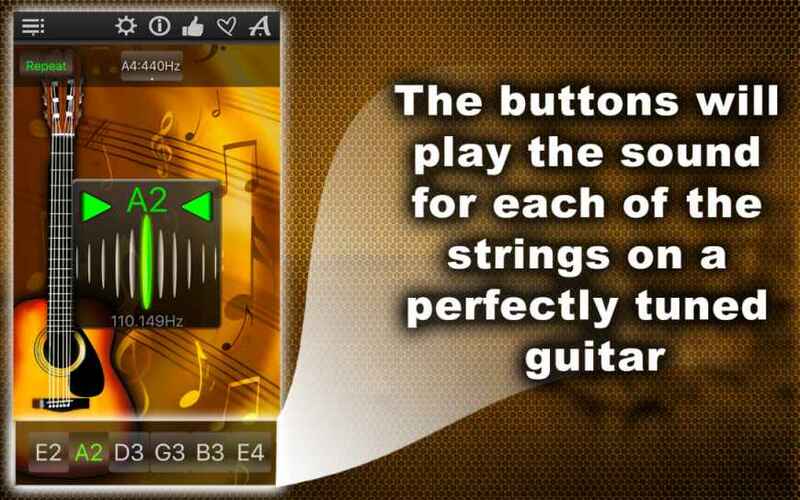 Download Easy Guitar Tuner Now!